Devon Williams’ hot streak. If the probability of hitting a single 3-point shot is 0.4, then then starting a game, the likelihood of hitting 8-straight 3-point shots is 0.4^8 or about 1 in 1500. The likelihood, at the beginning of a given game, hitting 8-in-a-row is pretty small. But, given a career or NBA wide perspective, we would expect this type of thing to happen, on occasion. No clear evidence of a hot streak. What about DiMaggio? 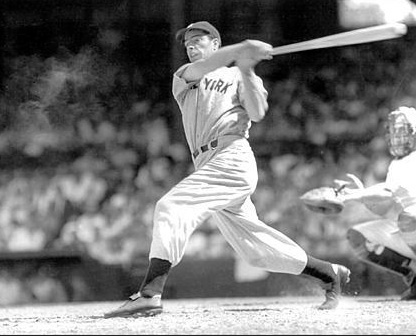 Let’s say that DiMaggio is a .333 hitter. That means, on any at bat, his likelihood of not-getting-a-hit is 0.666. If he has an average of 3.5 at bats a game, the likelihood that he will not hit for a game is (.666)^3.5 = 0.24. The likelihood that he will have at least 1 hit = (1-0.24)=.76. The likelihood that he will have 1 hit per 56 games is (.76)^56 = about 1 in 5,000,000. That is, at the start of any game, the likelihood that this is the beginning of a 56 game streak is 1 in 5 million. Is this unlikely in the history of baseball? Lets estimate that the only contenders to this are great hitters in the history of baseball, and imagine 75 great hitters. Each hitter had a 500 at bats per year over 15 years, that would be a total of 500,000 reasonable opportunities to begin a streak. So, hitting a 1-in-5 million event in 500,000 opportunities is surprising, but not impossibly surprising. Seems like a real streak. One additional caveat. Streaks are harder to come by than this estimate suggests. These estimates are based on the assumption that each basketball shot has equal probability and each day of baseball has equal probability. Actually, event-to-event variations in probability, even with identical average probability, lowers the likelihood of streaks. Large event-to-event variability lowers streak possibilities. A large and hard-to-quantify effect. So, for example, if Deron Williams is bumped on 25% of his 3-point shots, this makes streak likelihood lower. 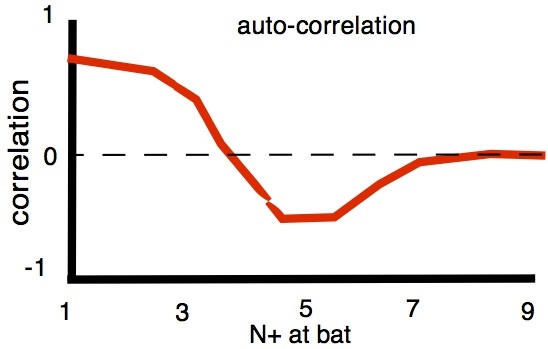 Another computational approach is autocorrelation. Don’t know if this has been done, but it’s conceptually simple. Take a single-season batting record of a single batter in the major leagues, with about 500 at bats. In a spreadsheet column record each in series as 0 or 1. Copy the record (in excel) and shift down a frame so that n matches with n+1. Do a correlation between the n and n+1 columns. If the correlation is statistically above 0, then performance an at bat predicts performance on the next. If this works, continue the shift distance in subsequent columns (n-to-(n+2); n-to-(n+3); …). Make a plot of correlation as a function of shift, and you’ll have an estimate of how long streaks last for the analyzed player. (If I had the data, I’d do this). This sounds somewhat pessimistic, but I’m confident that streaks exist. Certainly, there is a conscious bias in feeling that one is ‘on a roll’ or is watching a streak. But personal evidence seems overwhelming. For me, this is especially true in gaining mastery in a sport. When I play tennis (or try), there are times when shot-after-shot works, and times when shot-after-shot fails. And usually fails in the same way. Certainly part of this is the feeling of being on (or off) a roll. But its much more than that. One possibility is that streakiness is greater when acquiring a skill than after mastery. I’ll leave it at that. I feel that streakiness exists, especially during the acquisition of skill learning. I suspect that this is studied, and would like to know more about it. Control Systems, Physiology and Neuroscience. Since the days of Nortbert Weiner’s cybernetics, its been assumed that motor learning works in a feedback control mode. A command signal emerges, performance feedback returns, an error signal is generated, and correction is applied to reduce the error signal. The correction can be within trial (for slowish execution) or across trials, with learning. For large errors, correction is fast, large and crude, for fine-grained corrections, corrections are smaller. This feedback control model is commonly applied to cerebellar motor learning. It can also be applied to basal ganglia and cerebral cortex. Each system, likely, provides a different type of control. For example, cerebellum may control muscle force generation, while basal ganglia may control timing and sequence of movements. Neocortex may be a conscious, strategic motivator (“more left, next shot”). Applying a control systems perspective predicts streaks. Lets imagine a large error. You are driving (across the Verizanno Narrows Bridge) and a huge gust of wind makes you swerve off target. You turn the wheel in error control. Through a series of actions you swing back and forth, with each correction smaller than the last, until, after a second or two, we are back to a straight path. Feedback control takes time. Streakiness is a strong prediction. Oscillatory: motor actions are built on entrained rhythms, especially muscle efficiency. Feedback is continuous, and error correction involves some sort of harmonic resonance feedback. My strong suspicion is that continuous, oscillatory controls are the key. Rhythm. For fascinating discussions about rhythms read Gyorgi Buzsaki’s book “Rhythms of the Brain” and Rudolpho Llinas’ book, “Eye of the Vortex“, which has greater emphasis on motor rhythms and cerebellum. The rough idea is that motor function rides on rhythmic processing, and efficient motor (athletic) performance is, roughly, related to harmonic entrainment of rhythms. You get optimal efficiency and power when a team of rowers stroke in synchrony. Perhaps the feeling of being “in synch” and in rhythm is finding entrainment with an optimal set of motor frequencies. Although ‘synch’ and rhythm may be hard to achieve, one found they can stay for awhile. Finally, can a team be on a streak? I’ll leave this as an open question. My guess: yes. * Many thanks to Sam Wang. He helped, especially the SJ Gould reference. Wang seems to think that athletic streaks, generally, are imagined, not real. I’d like to further discuss cerebellum with him. ** thanks to Pascal Wallisch for the Gilovich, Valone and Tversky paper. This entry was posted in Neuroscience, Psychology, Sports, Uncategorized by jkubie. Bookmark the permalink.